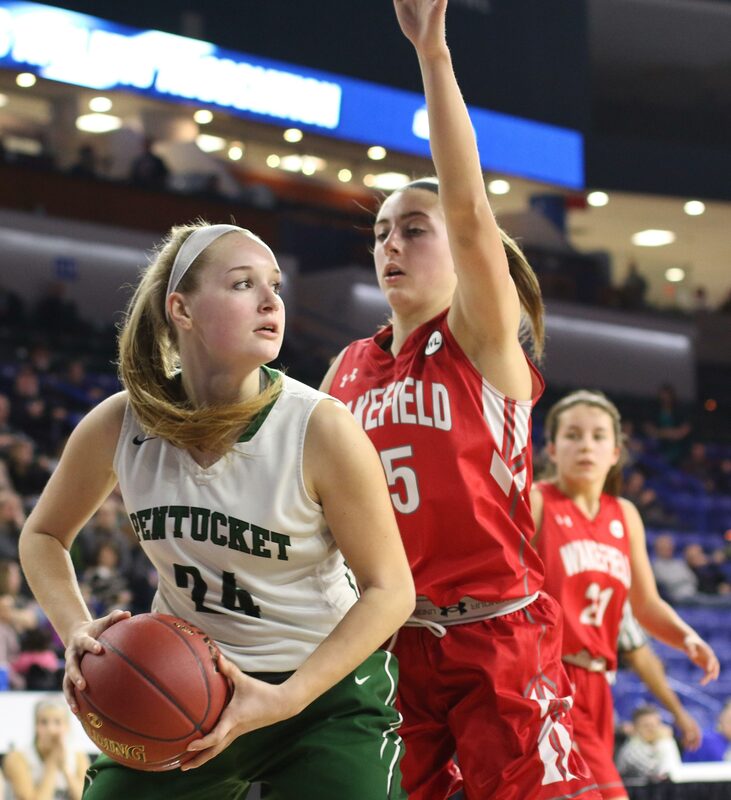 (Lowell MA) Rome wasn’t built in a day nor was that amount of time enough for Wakefield to prepare for Pentucket’s pressure. The result? 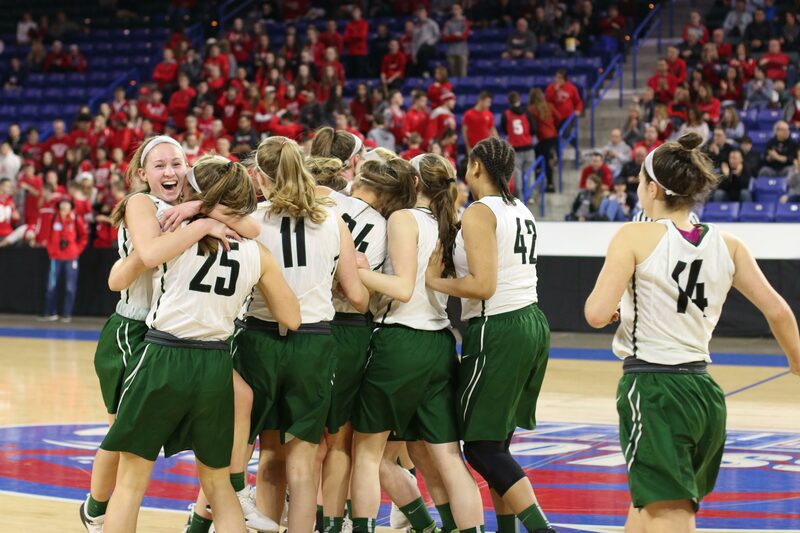 A 48-33 win by the Sachems (23-2) over the Warriors (18-6) on Saturday afternoon at the Tsongas Arena in the Divison 2 North final. “No team in the Middlesex League plays that type of aggressive, double-teaming defense,” said WHS coach Jason Pavey afterwards. 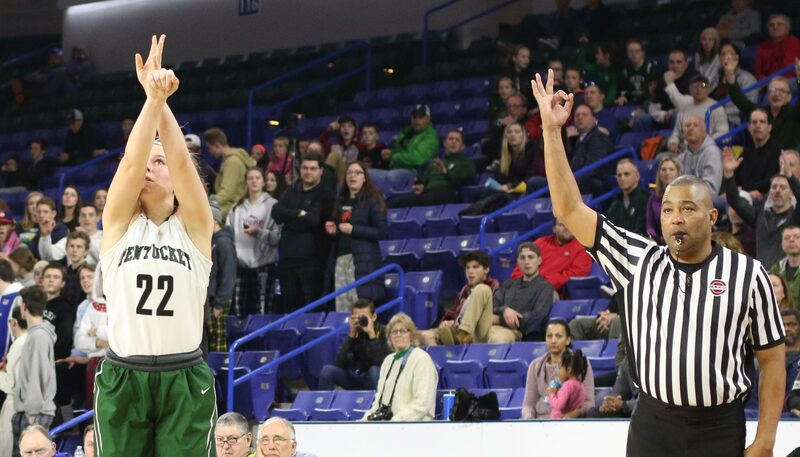 “It was tough to prepare for them in a day.” The Warriors reached the D2 North final with a win over Wilmington on Thursday. 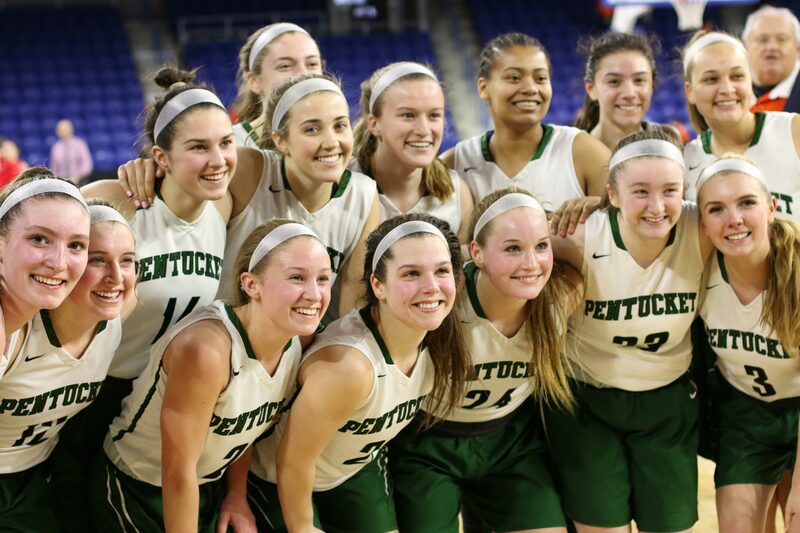 With today’s victory, Pentucket will return for a sixth time for a tournament game (Tuesday 5:45PM) at the TD Garden. The good news for Pentucket is that they won’t be facing D3 Archbishop Williams. The Sachems are 2-3 at the Garden and all three losses have been to the Archies. The Warriors (18-6) had size and seniors. 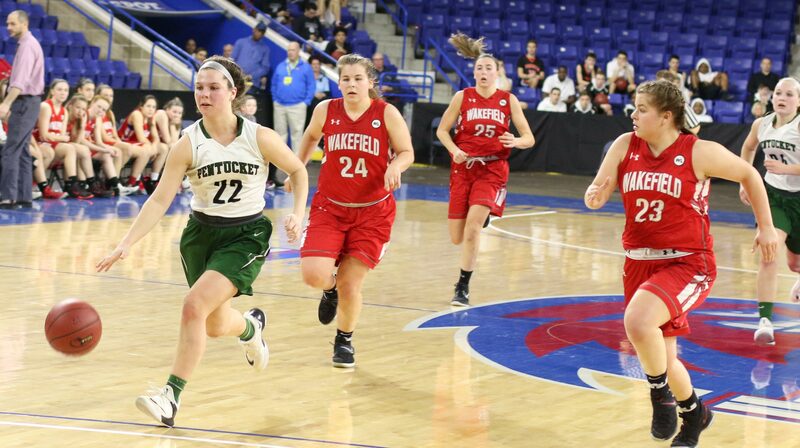 After being down by seven in the first quarter, Wakefield started the second on a run of five points on a rebound basket by Allee Purcell and a free throw as well as a layup by Hannah Butler. 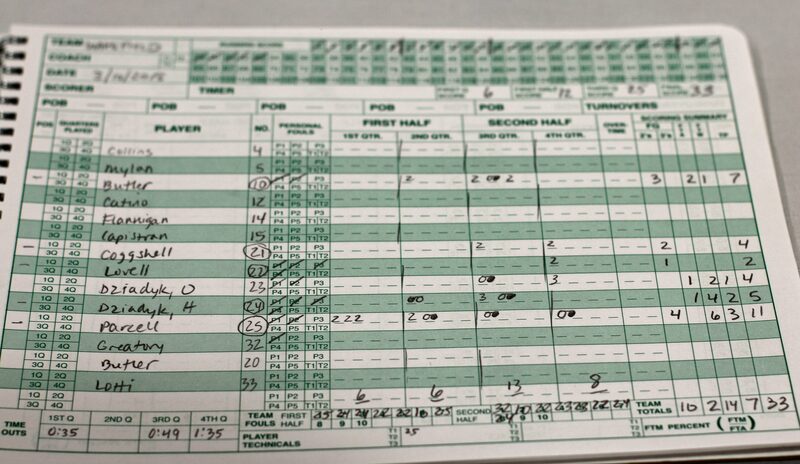 That narrowed the Pentucket advantage to 13-11 after two minutes in the second quarter. That would be as good as it would get for Wakefield. The rest of the quarter the Pentucket defense stymied Wakefield while the Sachems scoring picked up. Last six minutes of the half? 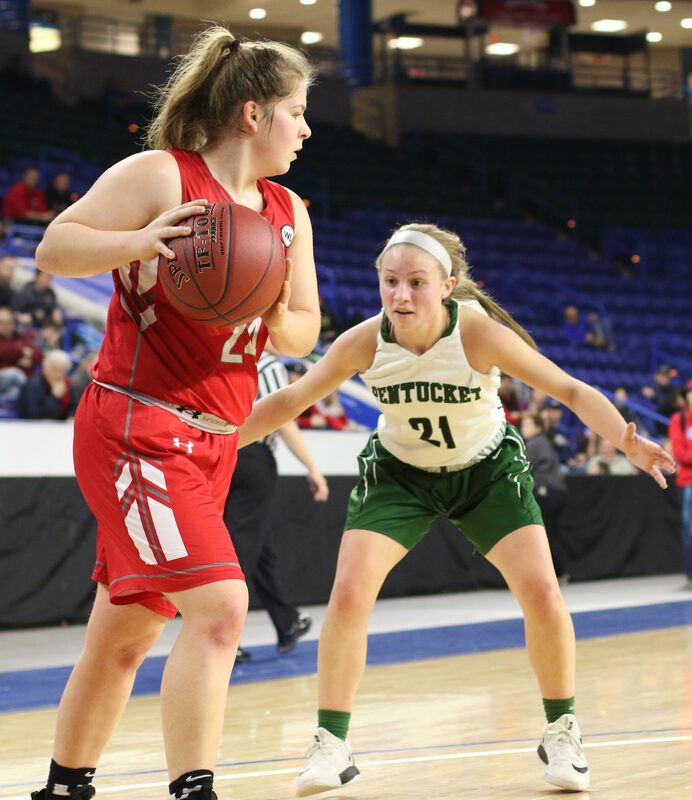 The Warriors had only a free throw (Hannah Dziadyk) while Pentucket collected thirteen points. In that breakaway segment, Maddi Doyle had a free throw, but all the other points were on 3-pointers. Casey Hunt started with an old-fashioned three. Then it was Maddi Doyle, left all alone, draining a long one from straight away. The last two? Angelina Yacubacci set up by Casey Hunt and Liv Cross. “The NBA lines on the court made it a little confusing at the start,” said Angelina after the game. The Warriors trailed 26-12 at the half. 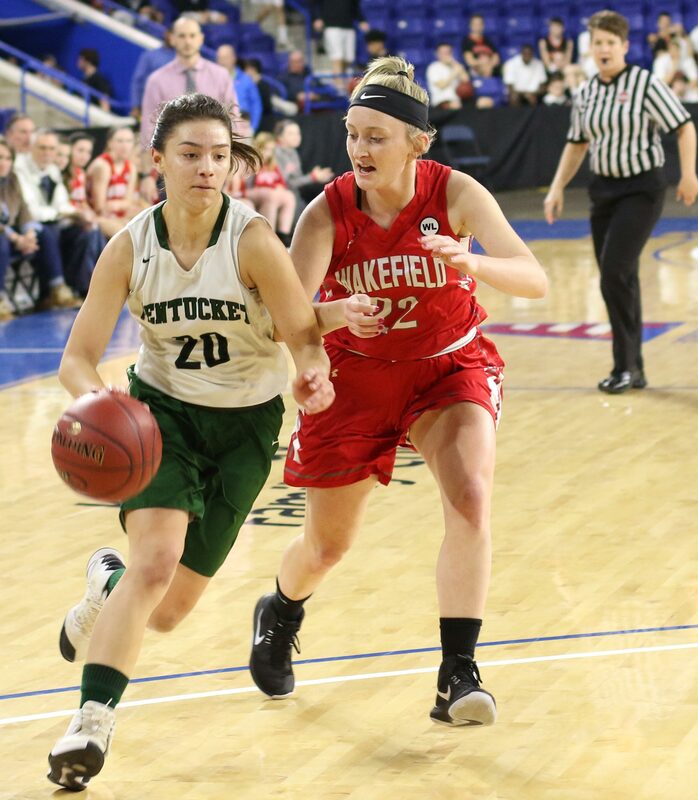 Pentucket’s lead was down to eight (33-25) after a buzzer-beating layup by Hannah Butler at the end of the 3rd period. 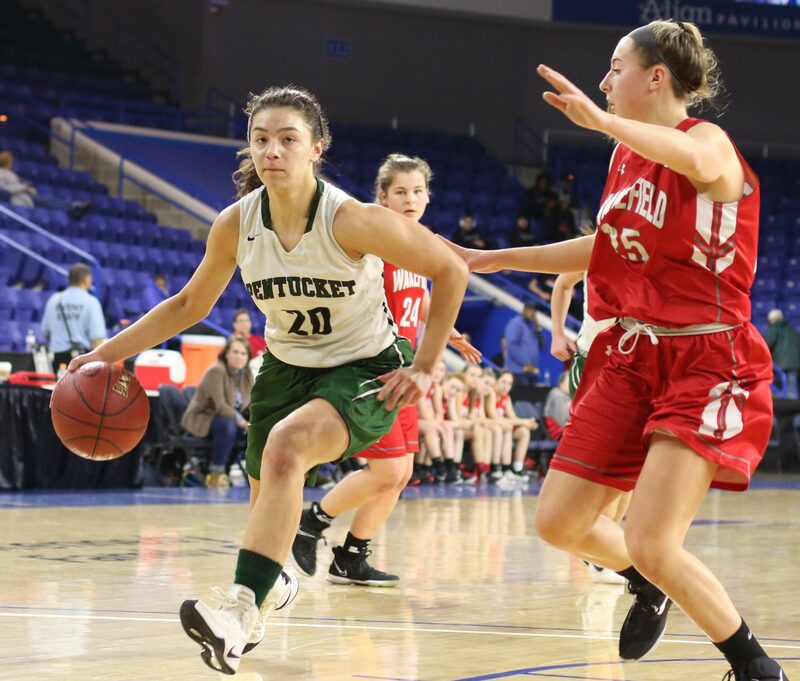 “They cut the lead to eight but then Angelina (Yacubacci) hit a three which was huge,” explained Pentucket coach John McNamara. The Warriors began the final quarter with four turnovers and the Sachems regained separation, 39-25, for good. The final was 48-33. 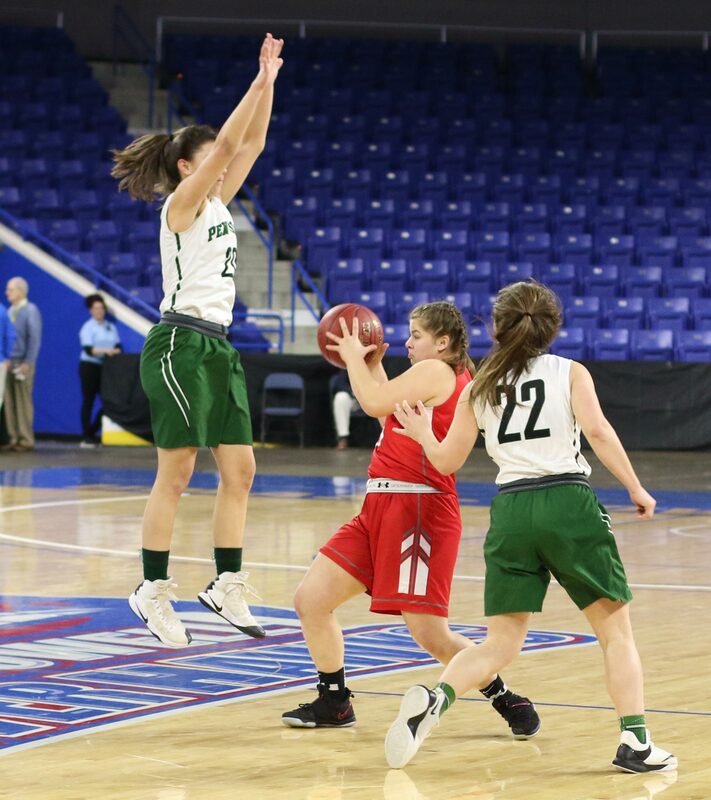 It is easy to notice the Pentucket defense but what I am starting to notice is their ability to run an effective half-court offense when they have to. Up by double-figures in the final quarter, there was plenty of organized movement that opened up lanes to the basket for layups or resulted in foul shots. 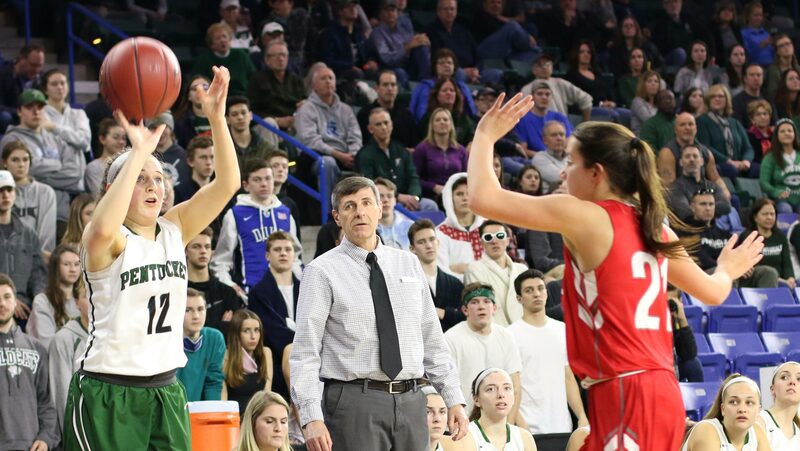 Angelina Yacubacci led all scorers with fifteen points. 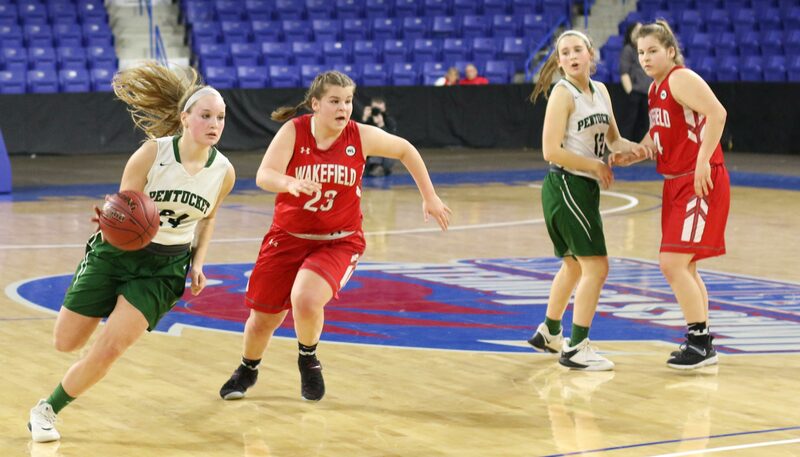 Allee Purcell paced Wakefield with eleven points. 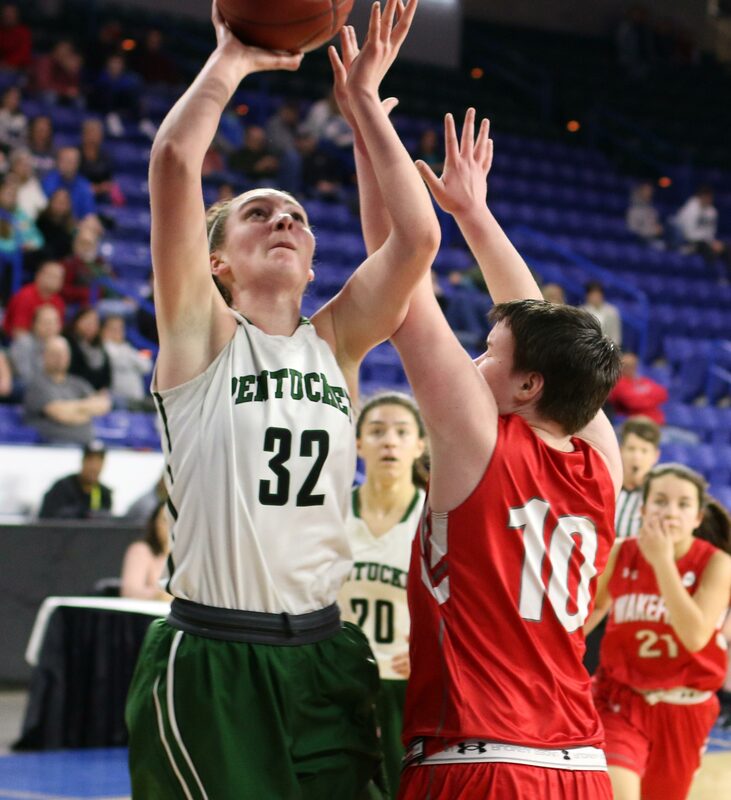 One of the keys to the Pentucket win was their ability to contain senior Hannah Dziadyk. 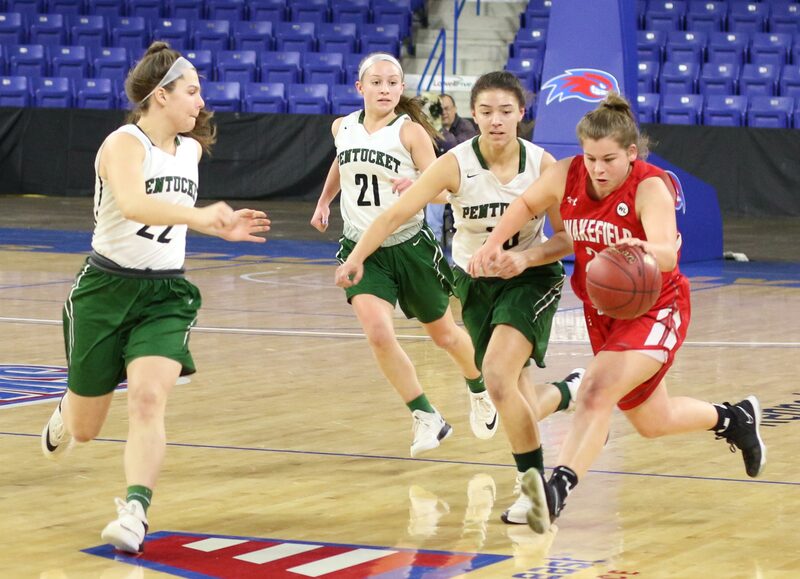 In this year’s post-season, Hannah had five 3’s against Burlington, seventeen points versus North Reading, and twenty-two points against Wilmington. Maddi Doyle was the primary defender on Hannah although it seemed to me that there were multiple defenders most of the time. Wakefield used a zone defense for part of the game. “It was the first time we’ve seen a zone in a while,” said Coach McNamara. The Sachems had several turnovers in the early going, trying to force passes into the interior of the Warrior zone. 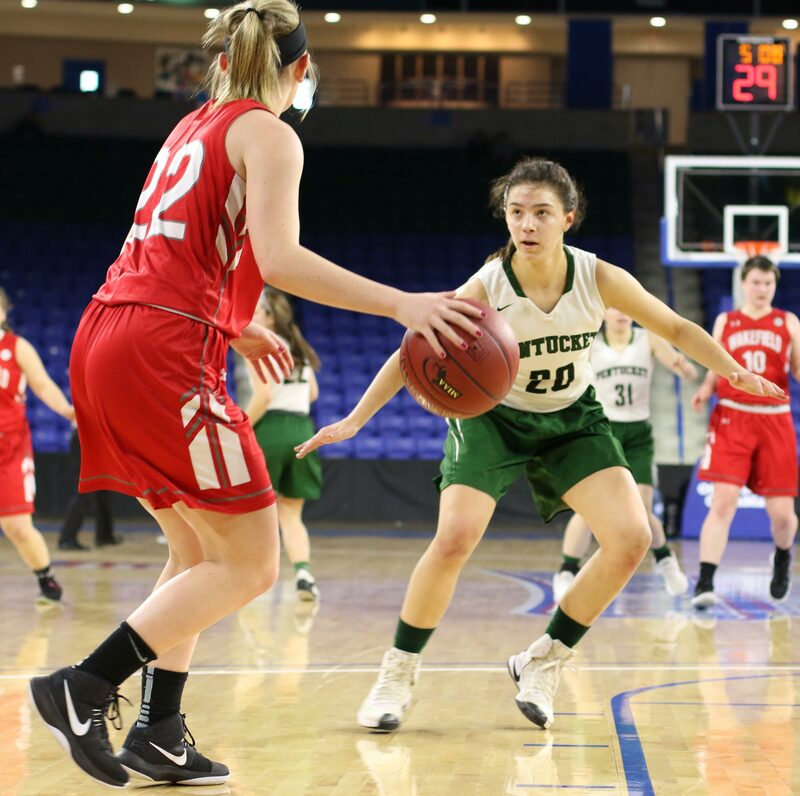 “We want the other team to play at our pace and we try to force turnovers,” explained Casey Hunt afterwards regarding her team’s style of play. I like the Tsongas Arena. The lighting is terrific.